2011 is almost here, which means it's time to take a look back at all things 2010—TV, movies, politics and, of course, music. 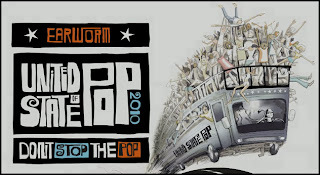 For the fourth year in a row, DJ Earworm has delivered his mashup of the top 25 songs of the year: the United State of Pop. This year's installment is titled "Don't Stop the Pop." 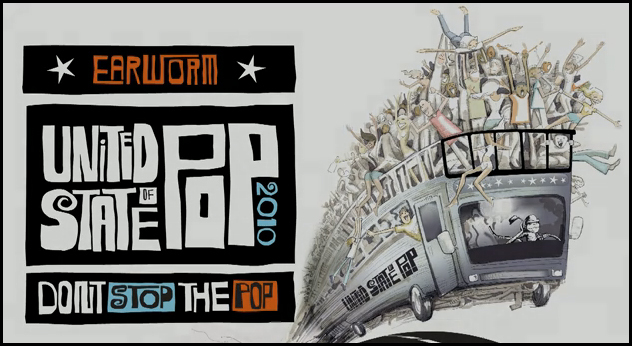 In 2010, pop has gone into serious all-out party mode. In 2009 the music was encouraging us to pick ourselves back up after being knocked down again, and to rock out to some great dance music while your at it. This year’s music tells us to keep going now that we’re up and having fun. In fact, the fun seems to be in such overdrive that it borders on recklessness. Usher urges us to ‘dance like it’s the last night of your life”, and Katy Perry wants us to “run away and don’t ever look back”. Even the songs that aren’t about parties have parties in their videos, like this year’s entries from Mike Posner and Lady Antebellum. Perhaps not as good as 2009, but it really does start to pickup around the 2 minute mark. And like it or not, you'll definitely be hearing this if you go out on New Year's Eve! To download a copy of the song, visit http://djearworm.com.